The prizes were awarded to two young scientists and two teams of researchers in physics, mathematics and medicine. Russian President Vladimir Putin awarded prizes in science and innovation for young scientists in 2016 on Feb. 8, expressing confidence that Russia has a fine future due to their important achievements. "The fundamental basis of this country has such deep and firm roots that its fine and wonderful future is inevitable," Putin said at the awards ceremony in the Kremlin devoted to the Russian Science Day. Russia’s science, its traditions, schools and unique achievements are both national and global heritage, Putin said. Today, Russia and the whole world face major challenges of technological development and ensuring environmental, biological and food security. "The character of these tasks means that they can be solved only with the help of science and modern technologies," he stressed. In late 2016, Russia approved a strategy of technological development defining the key priorities in scientific achievements. The strategy also outlines the task of searching for response to global challenges of the future. The Russian Scientific Foundation is developing a special program, encouraging talented and highly-educated people to realize their potential in Russia. The prizes were awarded to two young scientists and two teams of researchers in physics, mathematics and medicine. Among them are staff members of the Kurchatov Institute in Moscow, who obtained important data during the experiments based on the Large Hadron Collider. "This country made a significant and large contribution to the creation and implementation of this important international project. It is pleasant that young Russian scientists have an opportunity to work at the world’s most powerful particle collider," Putin said. Can Russia build a tech-based economy? A leading researcher at the Steklov Institute of Mathematics of the Russian Academy of Sciences Alexander Gaifullin introduced a new concept developing the theory of flexible polyhedral surfaces. Putin said the results of this work are important for constructing robots. 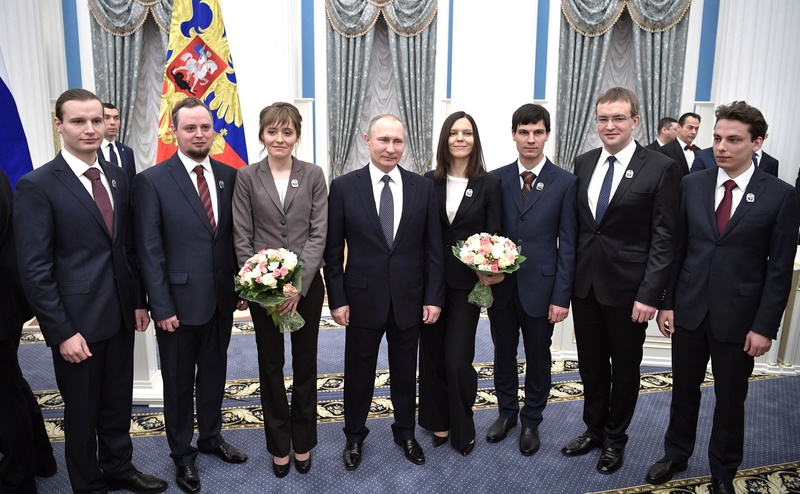 The Russian leader also noted the achievements of researchers of the Engelhardt Institute of Molecular Biology of the Russian Academy of Sciences Alexei Dmitriev and Anna Kudryavtseva, who created markers allowing diagnosing the widespread types of cancer. Putin stressed that these findings are already used both in Russia and in major clinics of 15 countries. A study carried out by doctor of Physical and Mathematical Sciences, a junior researcher at the Siberian branch of the Institute of High Current Electronics (IHCE) of the Russian Academy of Sciences, Ilya Romanenko, helped to obtain generators of powerful radio pulses that can block the work of electronic devices and may be used in the fight against terrorism. "High achievements in any scientific field pave the way for new breakthrough ideas," Putin stressed. "This proves that the activity of our laureates, who courageously choose the new way, relies on the best traditions of the leading scientific schools."